The pro athletes we watch on TV every weekend aren’t the only ones who get knee injuries. Nor are they exclusive to weekend warriors. More than 200,000 dogs suffer a ruptured cranial cruciate ligament (CCL) – the canine equivalent of a torn ACL – every year. Take Belle. 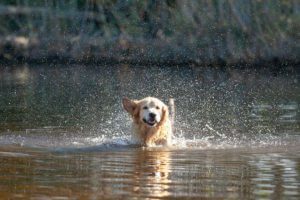 She’s a young, active golden retriever who loves to swim, go on walks with her owners, and pal around with her canine friends. But, when she was one year old she tore her CCL. She was chasing after a ball in the house, and in her exuberance, slid into the wall at an odd angle. She let out one yelp and limped over to a rug to rest. Within a few days she seemed back to normal. Belle continued to go on walks, but often after long hikes she would lay around the house more than usual. “She also stopped jumping on the couch, even when we gave her permission to join us,” her owner Ely Yakley explains. The turning point came on a hot summer day after Belle had spent hours swimming and jumping in and out of the pool. By evening, she couldn’t bear weight on her right rear leg. Ms. Yakley took Belle to her family veterinarian in the morning who diagnosed a possible torn cruciate and made a referral to one of our board-certified veterinary surgeons. Treatment options are either conservative management, which includes activity restriction, anti-inflammatory medications and pain management therapies, or surgery. 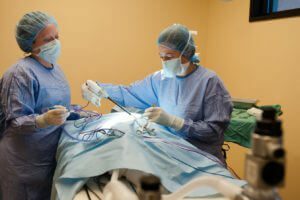 “Some dogs will improve without surgery, but in my experience they never will do as well as they do with surgery,” Dr. Cross reports. Many factors like the dog’s age, size, behavior and expected activity level are taken into consideration when determining the best treatment for a torn CCL. It’s important to weigh the options with the expert advice of your family veterinarian and a veterinary surgeon. Belle’s owners decided that the tibial plateau leveling osteotomy (TPLO) surgery, considered the gold standard for CCL repair – would be best for her. After her surgery, Belle’s owners also opted for her to receive physical rehabilitation (the equivalent of physical therapy in human medicine) which is recommended to achieve the best results. 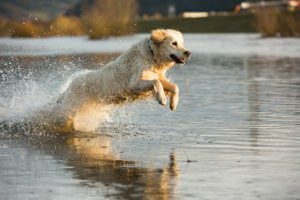 During rehabilitation sessions, pet owners learn exercises, techniques and lifestyle changes that help their dogs recover more quickly from surgery and can be used throughout their lives to keep them at optimum health.